We’ve championed Kampong Chhnang before. This sleepy riverside town is an ideal place to break the journey between Phnom Penh and Battambang. 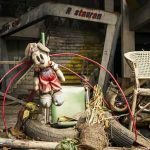 Floating villages, faded colonial architecture and a lively central market are all reason enough to hang around for a few days but, as this was our second visit to Kampong Chhnang, we wanted to find some alternative things to see and do. We didn’t venture into the countryside surrounding Kampong Chhnang during our first visit so we hired a couple of bicycles and headed out into the red-earthed landscape that is so often characteristic of rural Cambodia. 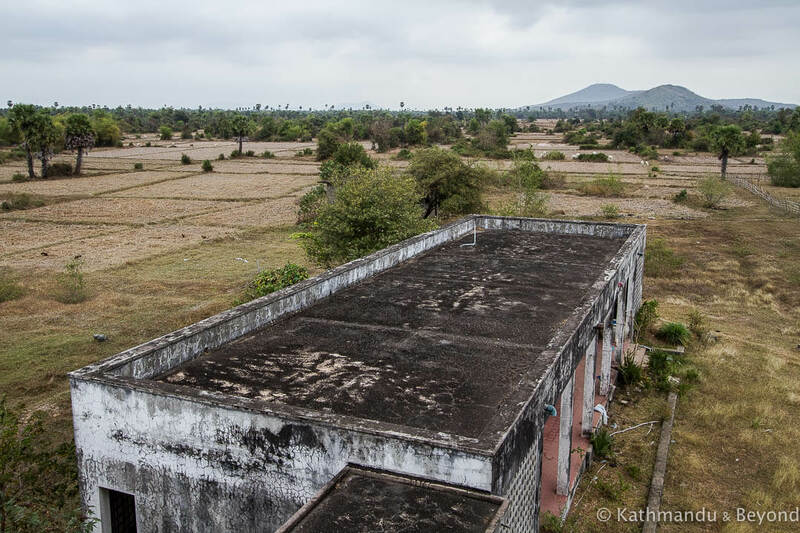 We were looking for a deserted military airport with a tragic history but would have to put in the peddle-power before eventually reaching it. 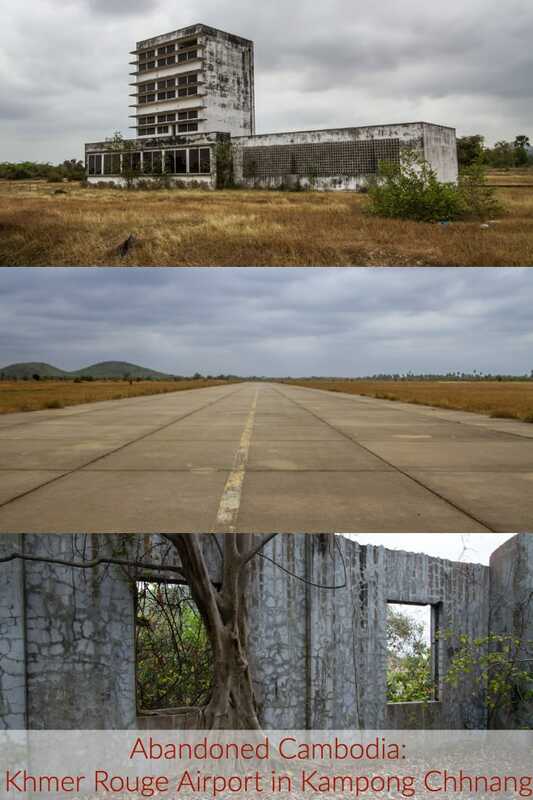 Located 14km west of the city, Kampong Chhnang’s airport was built using forced labour during the Khmer Rouge’s rule of Cambodia (1975-1979). 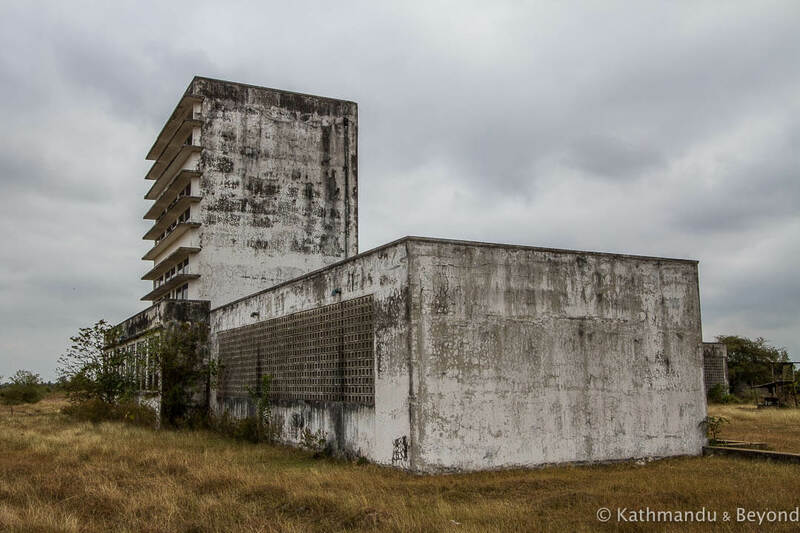 Most of those who were put to work on the airport were members of the Khmer Rouge’s army: predominantly regular soldiers who were purged by a paranoid regime and accused of betraying the revolution and/or having links with organisations such as the CIA and the KGB. Many were also denounced for having associations with the Vietnamese, the then sworn enemy of Democratic Kampuchea, the official name for Cambodia from 1975 to 1979. With more and more senior figures associated with the regime and other eyewitnesses dying of old age, there are fewer testimonies than there used to be and the true extent of how many lives were lost during the construction of the airport (and other projects in the vicinity – see below) will never be known but estimates range from 10,000 up to 350,000. There were, of course, many acts of barbarism associated with the building of the airport. Witnesses who did survive have spoken of atrocities they observed. There is no evidence that murders and torture were carried out at the airport itself (probably because of the number of Chinese advisors on site – see below) but, according to eyewitnesses, trucks left the area on a regular basis full of detainees and always returned empty. Screams and the smell of decomposing bodies were also reported. 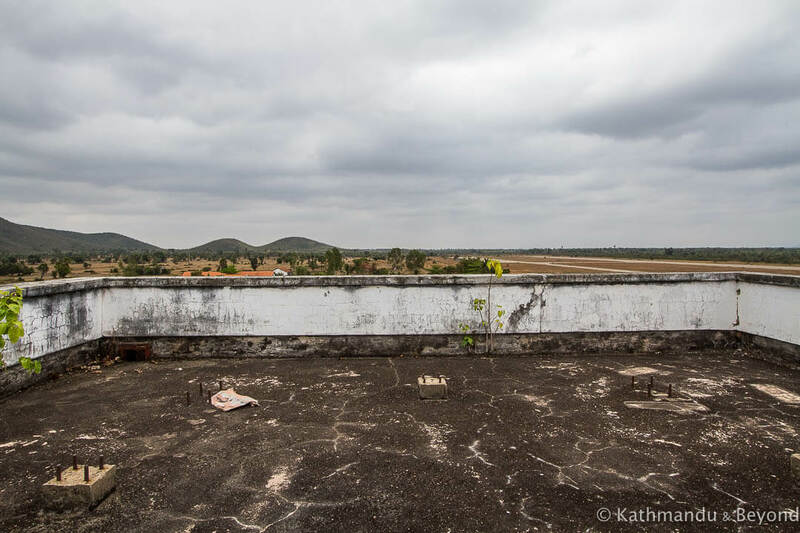 There are even allegations (*) that some of those working on the airport were transported to Phnom Penh and detained inside the notorious S-21 Prison (Tuol Sleng). 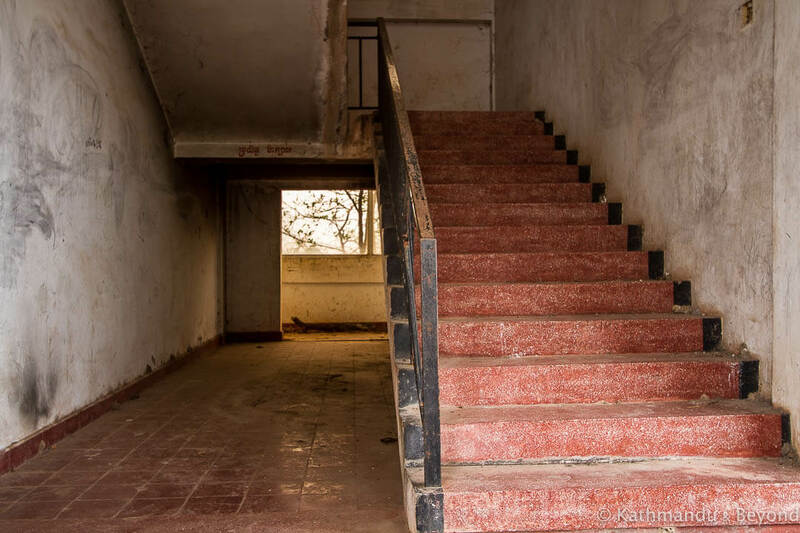 (*) My source for this information is the website of the Extraordinary Chambers in the Courts of Cambodia (ECCC), the tribunal set up in 1997 to try high-ranking Khmer Rouge cadres and officials. In the section I was reading, Comrade Duch, a senior Khmer Rouge leader and overseer of S-21 Prison, stated the above. The amount of work each detainee was expected to carry out depended on their perceived level of traitorism. Some worked from 7am to 5pm with a two-hour break while others were forced to work hideous shifts and often throughout the night. Everyone worked seven days a week and often food rations were woefully inadequate causing many inmates to die of malnutrition, sickness and fatigue. Although not widely reported or on a par with the more well-known Killing Fields at Choeung Ek (where over a million people were executed), I’m assuming there must be mass burial sites in the vicinity of Kampong Chhnang’s airport and that bones and skulls are being discovered by the local population. Construction of the airport, which was almost all done by hand, began in 1977 but it was never completed. 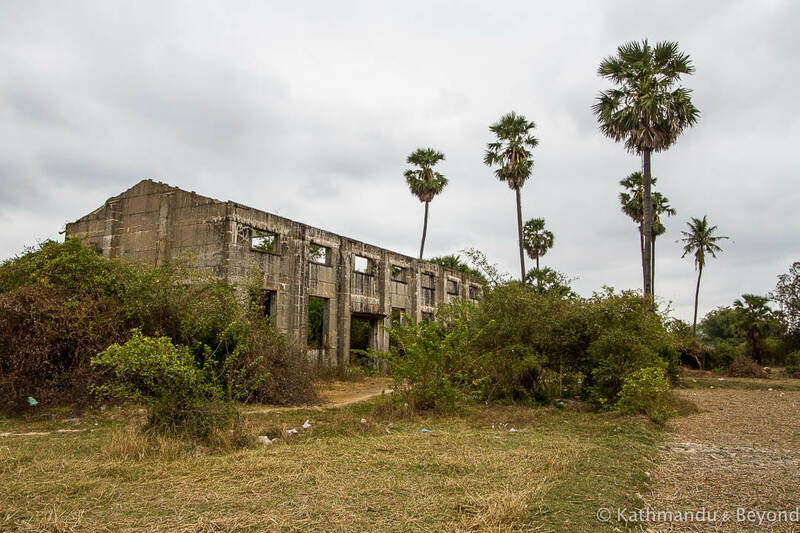 Neither was it used as a military airfield because, in late-‘78/early-’79, the Vietnamese overran Cambodia and ‘liberated’ its people from the grip of this unspeakable tyranny. Pol Pot and his cronies didn’t simply capitulate, however. 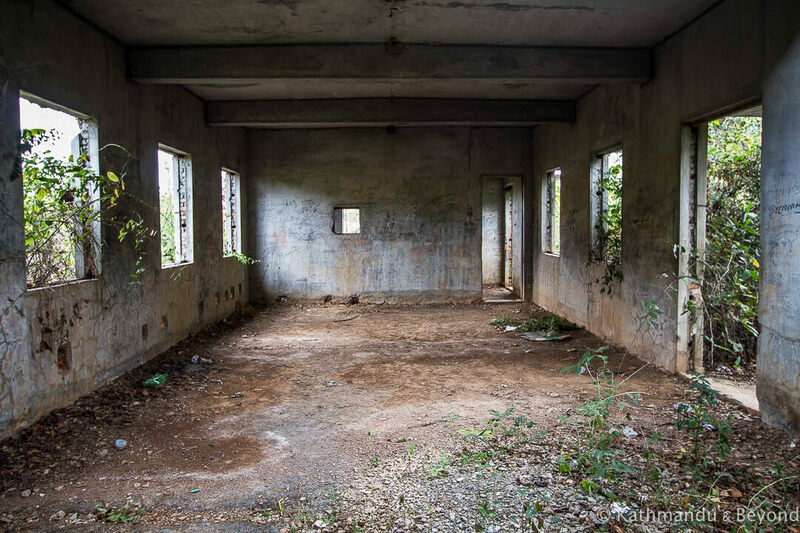 They fled to the hills and the jungles predominately along the Thai border and in the south of the country where they regrouped and, it is said that the regime systematically murdered all those who had been forced to build the airport just before work on it ceased. 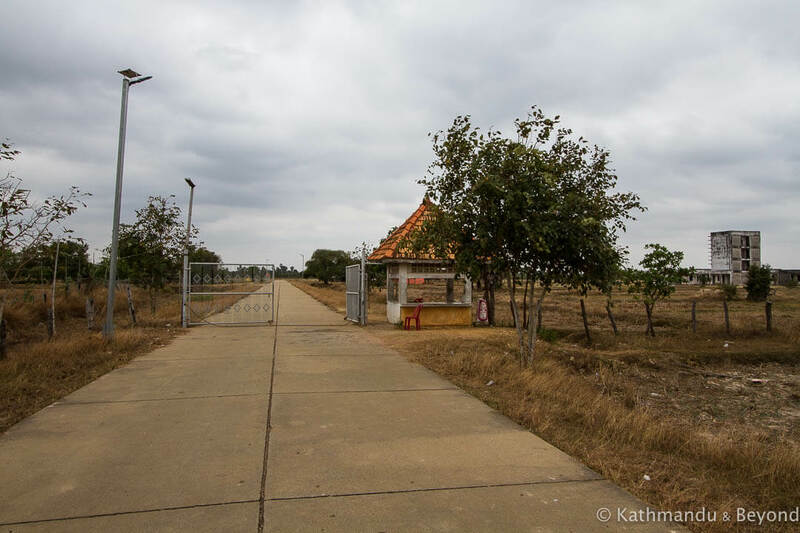 The most controversial fact about the construction of the airport, and indeed the entire period during which the Khmer Rouge were in charge (1975-1979), is the extent of China’s involvement. 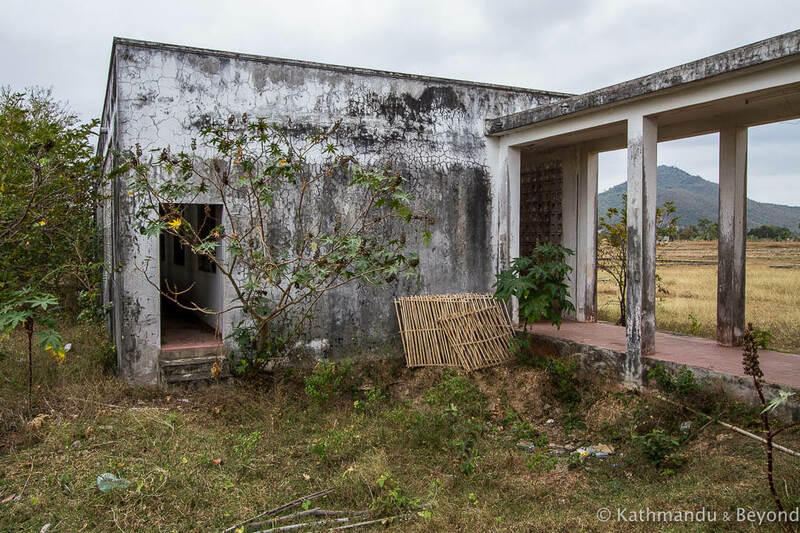 It is no secret that Mao’s government bankrolled the Khmer Rouge. The ideology of both regimes was the same and China had several reasons for wanting a foothold in the region back then. 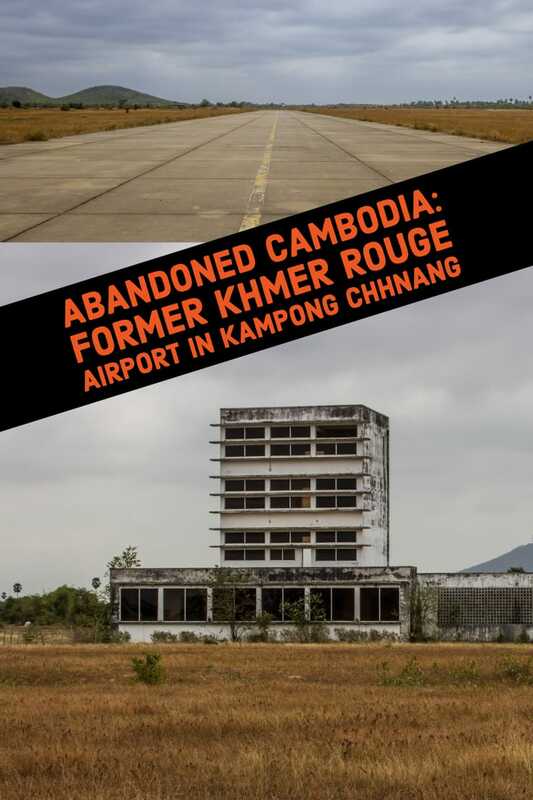 Thousands of Chinese ‘advisors’ were in Cambodia while it was under the control of Pol Pot and there is no doubt that Chinese engineers oversaw the construction of the airport and that it was built for the benefit of China, not for the Khmer Rouge. 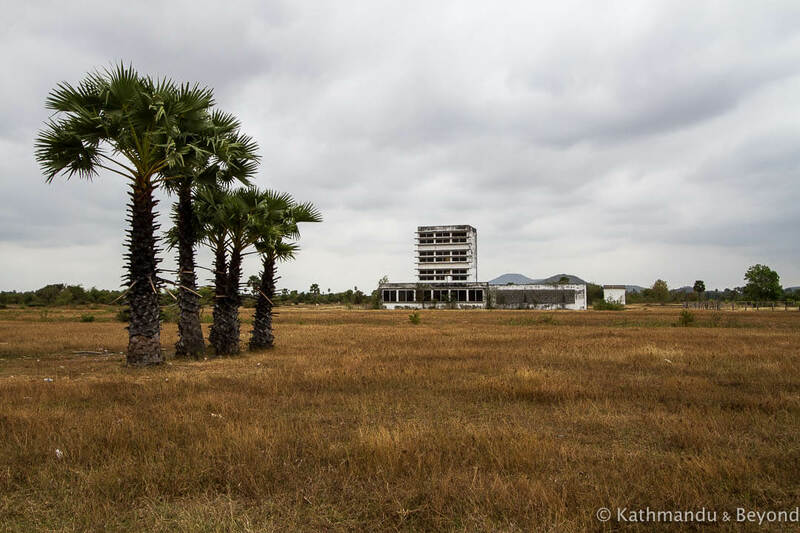 Present-day Chinese authorities, in particular the embassy in Phnom Penh, deny any involvement or knowledge of that time but there would have been plenty of reasons why China would have wanted a large-scale airport on Cambodian soil in the mid-1970s. Firstly, China needed rice. The Great Famine (1959-1961) and the Cultural Revolution (1966-1976) were both catastrophic for China’s food supplies and, although the Khmer Rouge was slowly starving its own people to death, there was decent rice production in Cambodia during this period and the People’s Republic wanted it. China doesn’t share a land border with Cambodia and getting large exports of rice out of the country by air would have been the only logical solution. China’s rocky relationship with neighbouring Vietnam would have been another factor for wanting to build a military airport in the centre of Cambodia. China was wary of Vietnam’s success in evicting first the French and then the Americans from within its borders and Mao was concerned that the Vietnamese would become too strong a power in the region. This came to a head in February 1979 when China and Vietnam had a brief war (3 weeks and 6 days) caused by the latter’s invasion of Cambodia a few months earlier. You have to wonder if, had the airport been fit-for-purpose, the Chinese would have used it to carry out airstrikes? The final thing worth considering is the fact that Cambodia didn’t have a military air force at the time and, what with the Khmer Rouge’s policy of returning to ‘Year Zero’ and its subsequent de-industrialisation of the country, there was no chance they were going to produce one anytime soon. It didn’t make sense for them to use resources (slave labour, building materials etc.) to erect something of this nature and the only logical conclusion is that it was built for an outside power, in this case, the Chinese. 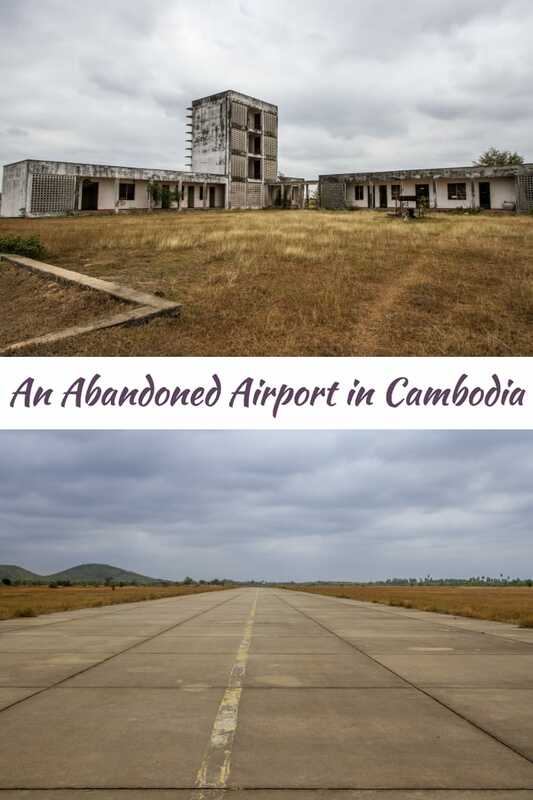 As an aside, and of interest to me personally because I first visited Cambodia at that time, the only period in which the airport saw any serious action was when United Nations Transitional Authority in Cambodia (UNTAC) were in the country between March 1992 and September 1993. In brief, UNTAC was a United Nations peacekeeping operation who were in Cambodia to try and restore order and oversee the important 1993 elections. They used the airport quite a bit because, apart from the main one in Phnom Penh, it was the only other airport that could accommodate their aircraft. 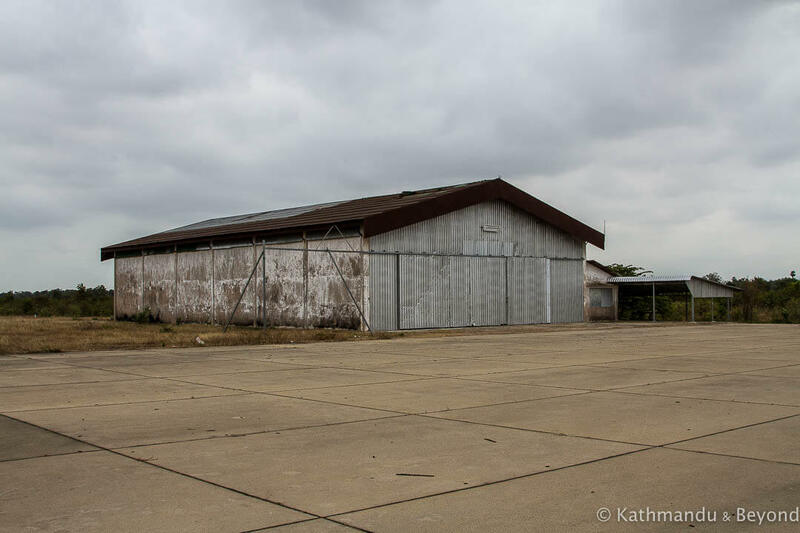 Airports, even abandoned ones, are pretty easy to locate on Google Maps but, given that the one on the outskirts of Kampong Chhnang belongs to the Royal Cambodian Air Force, we weren’t sure we’d be able to get inside the grounds once we had found it. 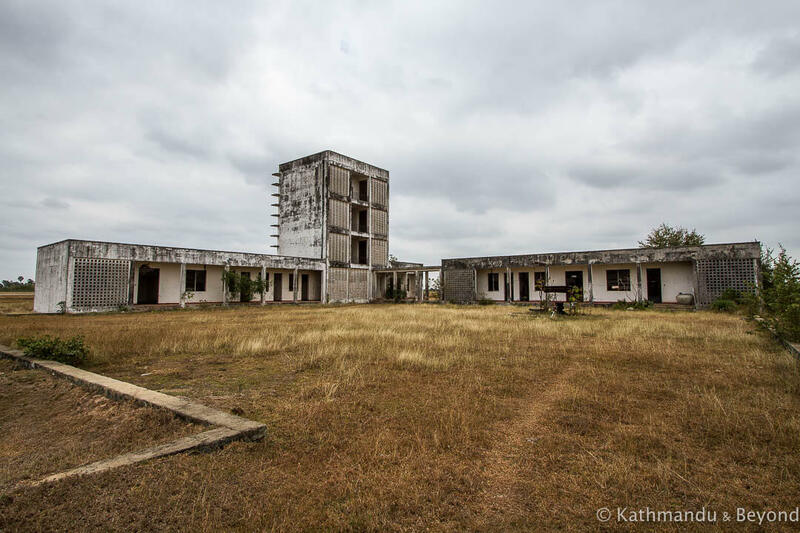 As we approached the airport compound, a military guard with an automatic rifle slung over his shoulder approached us. He crossed his arms in the X shape to indicate we couldn’t come inside the gate. Smiles and gestures didn’t work and, as he didn’t speak English and we don’t speak Khmer, the conversation stalled somewhat. But then we pulled our metaphoric rabbit out of the hat. This was in the shape of a rather battered tourist information leaflet produced by the Cambodian Tourist Board that we had found lying around at our guesthouse the previous day. Not only did it list the airport as one of the things to see in and around Kampong Chhnang, it suggested, and I quote, that “a small fee ($1) might be needed for the guard”! After showing him a photo of the airport in the leaflet he conceded it was OK to let us in, and Kirsty’s extremely limited Khmer determined he was asking for 1,500 riel (US$0.37, £0.25) from each of us. Entrance fee/bribe paid, he told us we could come inside for thirty minutes and then we would have to leave. He then returned the short distance to the guardhouse and joined about half a dozen more military personnel who were all seated in a circle playing cards. Half an hour wasn’t long but we were on bicycles and that aided our exploration. Actually, out on the 2.4km-long runway, there wasn’t a whole lot to see. 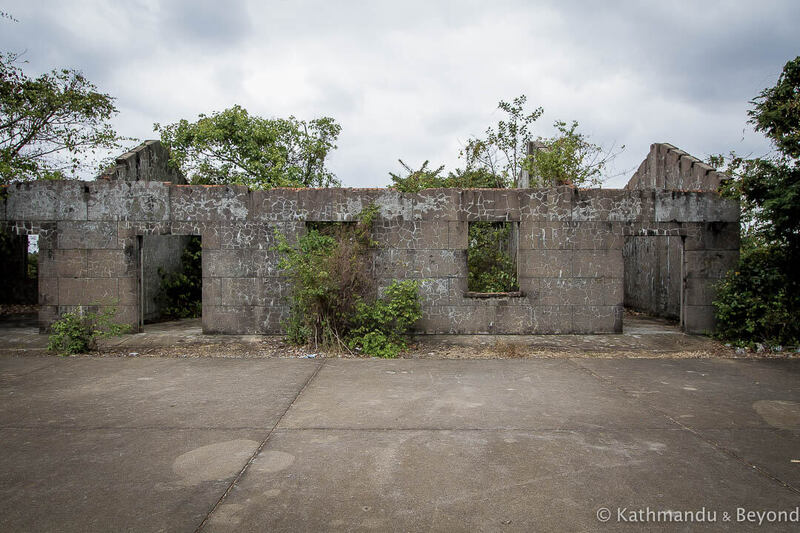 There were a few outlying buildings that were either locked or derelict and the most interesting thing was the landing strip itself. Made of reinforced concrete, it was incredibly smooth and well maintained and had obviously stood the test of time. 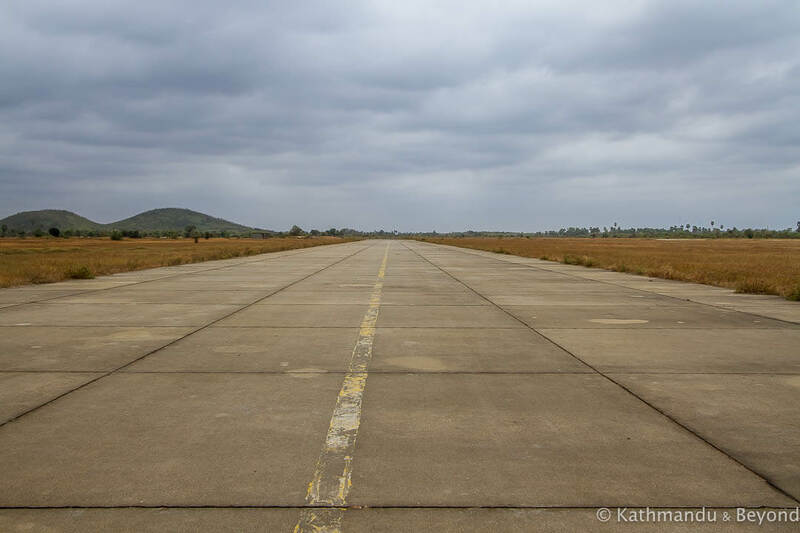 We had heard that locals with a penchant for speed came out to the runway every now and then to race up and down as fast as they could on their motorbikes. We even managed to get up a decent speed on our pushbikes but it felt strange enjoying ourselves on a strip of concrete that had caused so much misery and death so we didn’t play that game for very long. Besides, the clock was ticking and we really wanted to get closer and possibly go inside the main terminal building. We kind of knew it was off-limits. The guard hadn’t specifically told us so but when he let us in, he pointed us in the direction of the runway only. What’s more, we had read online the experiences of others who had visited the airport and they had been told directly that they couldn’t approach the building. Checking the time, we had about 15 minutes spare, so we cycled as close to the guardhouse as we could without being seen. The handful of personnel were all well into their card game and we took the opportunity to quickly cycle undetected to the back of the terminal building. Leaving the bikes propped up against the wall, we dashed around the structure and hastily took a few photographs. Even the rooftop was accessible but we knew we would probably be spotted if we stood up on it so the few photos we took were all taken in a crouched position. With minutes to spare, we cycled back to the runaway and approached the waiting guard via the same route we had entered so not to arouse suspicion and potentially be forced to delete our photos. It’s fair to say that Cambodians aren’t the world’s best timekeepers but this guy was up and away from his card game and waiting for us exactly 30 minutes after he had permitted us entry. There has been overseas commercial interest in acquiring the airfield and the land surrounding it but nothing has ever come to fruition. 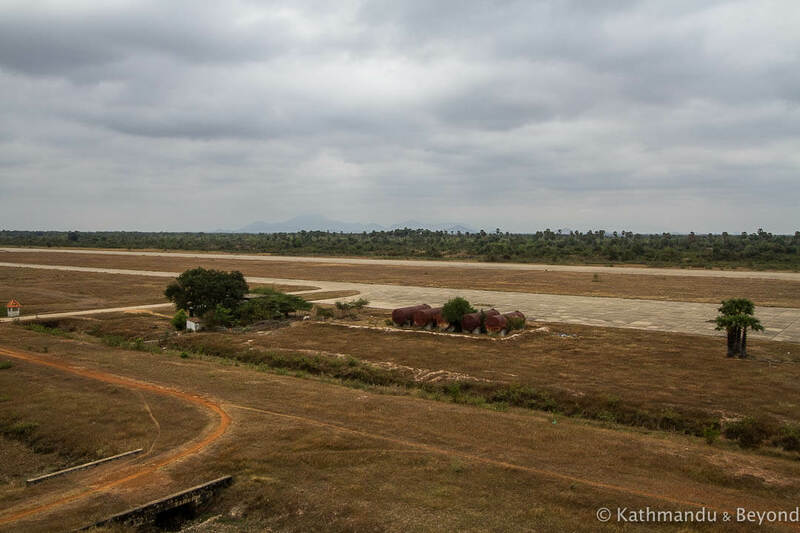 In 2012, the Cambodian government made public its plans to re-develop the area as a civilian airport. They acquired some of the lands which presumably didn’t already belong to the Royal Cambodian Air Force and, in a statement, Hun Sen, the current prime minister (and a Khmer Rouge defector), said how the airport would be brought up to international standards and alleviate some of the pressure on Phnom Penh’s airport. The announced completion date was 2025 but there was no evidence of any construction work taking place when we visited in February 2018, plus I can’t find anything further online to suggest that the project is moving forward so I suspect this date is no longer a realistic one. The countryside around Kampong Chhnang was strategically important for the Khmer Rouge (and no doubt the Chinese!). 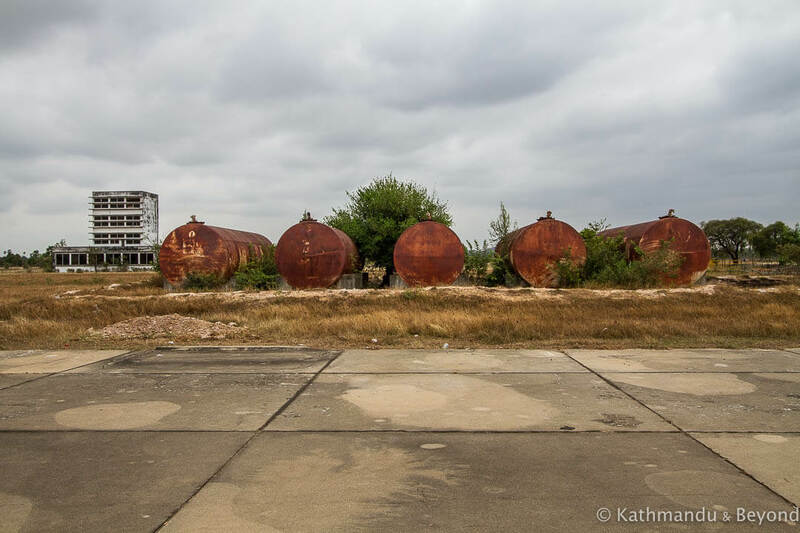 Indeed, the location for the airport was chosen specifically because the nearby mountains could be quarried, radar systems could be installed on top of them and a secret bunker blasted into the ground below. Along with the airport itself, other structures were also erected. To the right of the long entrance that leads to the terminal building are the remains of some military housing/barracks and similar buildings can also be found a few hundred metres up a dirt track on the other side of the main road that cuts through the surrounding countryside. 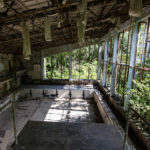 All of the buildings are shells these days and some are quite overgrown but the encroaching foliage was nothing compared to that which has engulfed some nearby water tanks. 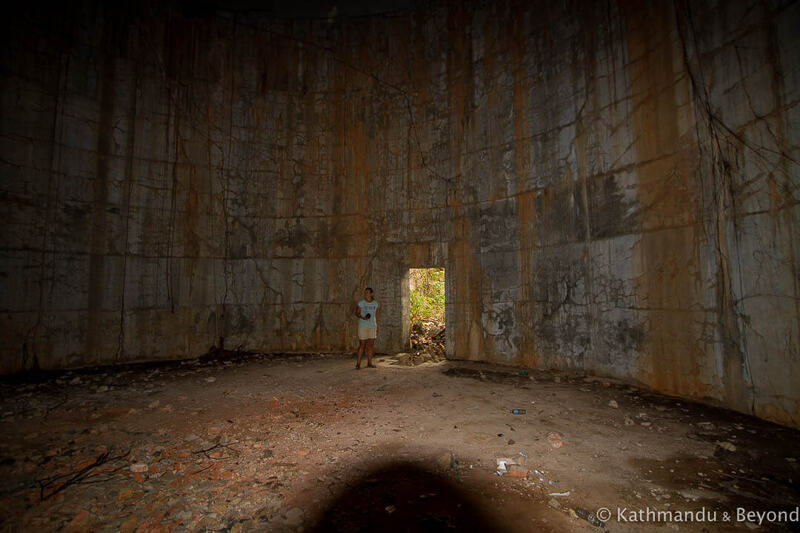 Constructed to supply water to the barracks and the airport, these huge concrete tanks (around 20 metres high and 12 metres in radius) have been completely swallowed up by the surrounding jungle. They were extremely well camouflaged and we had quite a job locating them. 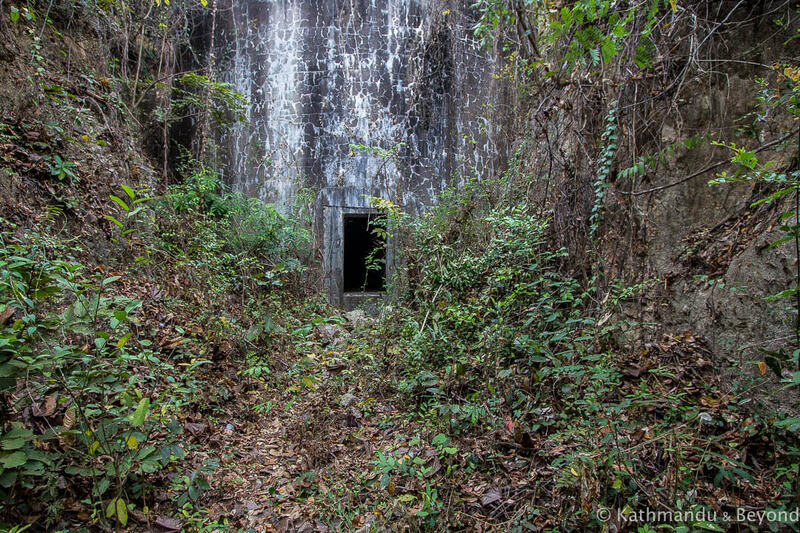 Even when we did find one, traversing the undergrowth to get to the entrance was a nervy, and also extremely humid, experience. Plenty of snakes, spiders and whatnot live in the undergrowth and the pathways weren’t that clearly defined. We managed to enter two of the water tanks unscathed bar a few ant bites (red ants are vicious – fact!). There wasn’t a great deal to look at once we did get inside but the hole at the top, presumably to let in water, also gave some light and created fantastic acoustics. The short (and silly) video below will provide a sample of the incredible sounds we experienced inside the chambers. Apologies for the strange aspect ratio – we initially uploaded it as an Instagram story. We had also heard about a fortified concrete and steel bunker cave close by. Located around 3km from the airbase, the cave was reportedly blasted and dug out of the nearby mountainside. Once more, forced labour was used and, by all accounts, conditions for those who worked there were even worse than for those who worked on the airport. The tunnel complex apparently extends into the mountainside for about 350 metres. Despite a few wild goose chases and the assistance of some well-meaning locals, we couldn’t find the entrance to the bunker cave and eventually gave up. Maybe it was just as well we didn’t find it. According to this account in The Cambodia Daily, the interior of the cave is grim,. 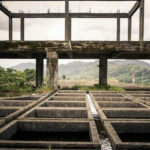 In the wet season, you are likely to be waist-deep in murky water while in the dry season it’s an effort to trudge through the half-baked mud that is underfoot. The interior is very dark and lacking in fresh air and also home to snakes and bats, none of which sound particularly appealing. 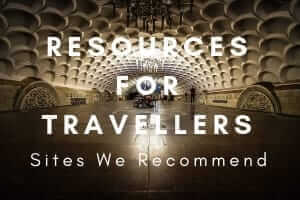 You won’t find an airport bus, or any kind of public transport, running to this airport! We cycled (approximately 14 kms) and although the ride wasn’t strenuous, it wasn’t enjoyable. The option is to either take the backroads which are incredibly dusty (Cambodian red dust) or the main road. If you don’t want to cycle the best option is to hire a remork (Cambodian style tuk-tuk) to take you. I came across this article after reading a tabloid story purporting that Malaysian Airlines flight MH370 stopped here on the flight’s tragic and mysterious journey. Given the source of the information -they even jazzed up the story by claiming the airport is “secret”, I doubt this statement is true. However, the Google Maps information on the location piqued my interest in the history of the airport. This article was a very informative “light read”. It’s very upsetting, but important, to learn even more about the human rights violations which occurred under the Khmer Rouge.